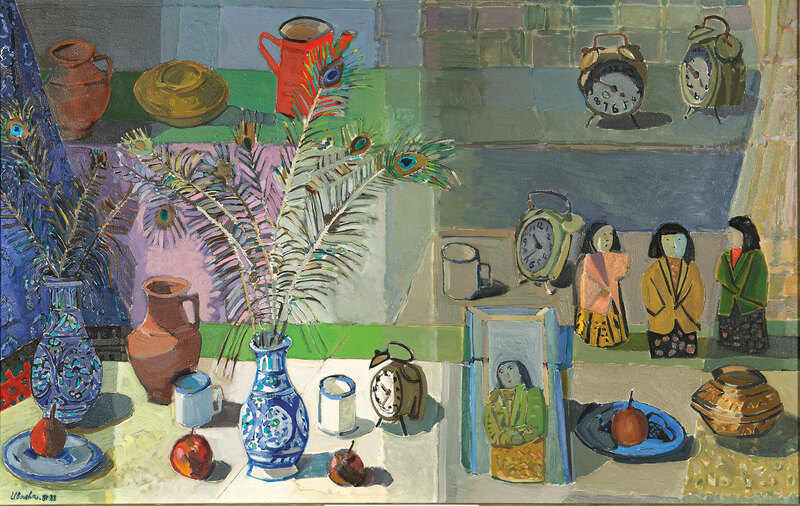 Amine El Bacha, born in 1932, spends most of his time in his studio in Beirut and in Cafes, writing, drawing or painting. He is considered one of the masters of Lebanese art. His art adorns the walls of some of the most famous institutions,museums, and collectors’ homes all over the world. His colorful paintings and watercolors are always full of light. His work is truly outstanding. His art is one of passion, of purity and tranquility depicting only the beautiful. If you are like me, one of those who look to art to provide shelter from the disorientation of the modern world, then you will find eternal bliss looking at El Bacha’s paintings. His work ensemble highlights his inspired shuffling of mediums, his even-handed willingness to take from one to stir up another. He focuses on wholeness, simplicity and monumentality, in planes that bent and angled in ways that suggest fragments of Cubism. His paintings, created in Beirut and Paris, greatly resemble the musical scale, where a mantra is repeated vigorously with passion. His artistic technique and his intellectual clarity are clearly reflected in his work. I can write all day on El Bacha’s paintings, they are reminiscent of Beirut and Lebanon. His beautiful brush strokes evoke the soul of the country. The warmth of his colors and the passion of combining elements together to create a perfect compositions, is a reflection of the world he lives in, a Lebanon seen by the eyes of her artist, just like a woman’s beauty is only understood by the eyes of her lover. Amin El Bacha is more concerned with the free color, which allows for expression in his work. It allows for an open, free way to depict the objects which are the central focus of his paintings and drawings, allowing for a decorative style. In his paintings, color is responsive only to emotional expression and the formal needs of the canvas, not the realities of nature. He has courage to return to the purity of means in depicting this land in abundant shapes and colors. He is Beirut’s true poet, as he describes her only from the heart. His paintings are like poetry, with a beautiful flow to them, that paints a picture from one line to the next. Matisse once said when asked abut his art; “What I dream of is an art of balance, purity, and serenity devoid of troubling or depressing subject matter… a soothing, calming influence on the mind, something like a good armchair which provides relaxation from physical fatigue, ” that’s exactly how I feel when I look at his paintings. It sends me beyond what others could see, far from what my mind could reach, a place of fantasies and dreams, dancing in rhythms and hues.